A duo that will blow you away! Having had an anorak moment with YouTube,.. I can safely say this will inspire! OK if not you it did me! I have been following this documentary by the BBC and its amazing. Discovering the remoteness and extreme environments humans can live in. We all have an inherent nature to survive. The question is can we all do so with grace, joy and poise? Open to all levels, all ages the workshop provides a safe environment to explore trust, connection and playfulness. 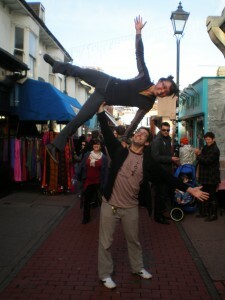 Both Jaqui and Jesse will combine elements from Yoga, Acrobatics, and Thai Massage. This workshop is a great opportunity for the beginner and seasoned practitioner to review the FUNdamentals. We will cover asana sequences, partner stretches, assisted inversions, basic partner acrobatics, therapeutic flying and Thai massage. After enjoying a sample of the many elements of the practice you will have first hand experience of what makes up AcroYoga. No yoga experience required, no partner needed. Come support and be supported. I have recently discovered this little genius of a puppet, called Puppetji! Guaranteed to make you laugh or at least smile and full of wise wise works as you would expect. 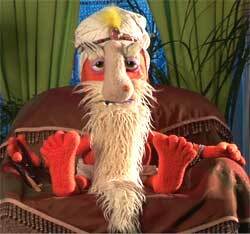 Check out his thoughts on meditation. Enjoy!